All I can say is Awesome! I am so pleased with Windows Phone 8. WPCentral: There are two areas in which Windows Phone 8 differs from its predecessor: the core of the OS has been updated with the NT kernel and the addition and refinement of features. Consumers don’t need to know about the kernel specifics but they will see the results: new, top of the line hardware. 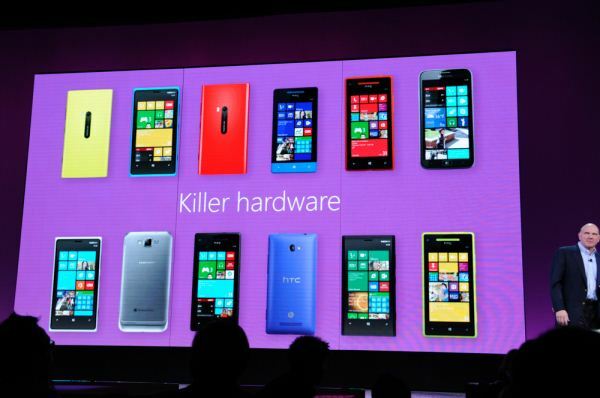 That hardware will be evident in a few weeks when devices like the HTC 8X and Nokia Lumia 920 become available. Microsoft has also spent a lot of time listening to feedback on how people used their phones. As a result, Windows Phone 8 brings many new refinements that should please current users and make new ones happy. With the new NT kernel, the same as found in Windows 8, Microsoft can finally reach for the stars by allowing developers native access to bring Direct 3D games to the OS, allow new hardware onto the platform to stay ahead of the competition and to find a balance between the chaotic world of Android and the walled garden of Apple. LiveSide: The Windows Phone 8 SDK will be available as a public download beginning tomorrow, from Build. 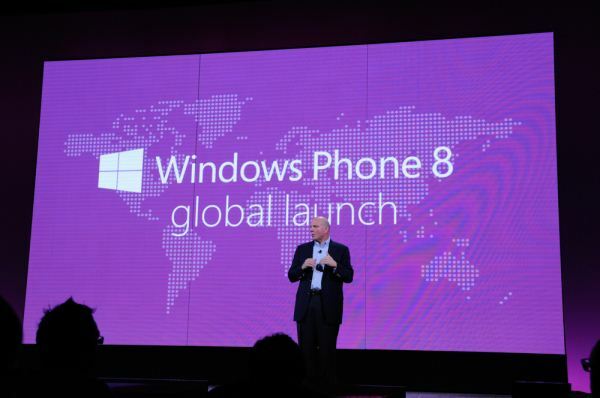 GeekWire: Microsoft is looking to Windows Phone 8 to gain new traction against Android and iPhone. The new mobile operating system shares a common core with the Windows 8 operating system. Windows Phone 8, rolling out on new devices this fall, won’t be available as an update to existing Windows Phone 7.5 devices, but those users will get some of the features, including better customization of the Start screen, in a Windows Phone 7.8 update. YouTube: Joe Belfiore, Corporate VP of Windows Phone, shows how you can childproof your phone with Kid's Corner, collaborate with your family or coworkers in Rooms, use Live Apps that provide real-time information at a glance, and back up everything to SkyDrive. “Live Apps” can now update your lock screen with whatever photo you like. WP.com: Pin the Live Tiles you want, and snap! There’s the stuff you care about, updating in real time, right on your Start screen. You can pin people, apps, songs, websites, directions, games, photos, docs, and more. Only Windows Phone has Live Tiles, and only Windows Phone lets you pin what you love. You can pin any app to your Start screen. But when you pin Live Apps, they’ll deliver info and updates in real time—like fresh Groupon deals, flight info, news headlines, and more. Pin, unpin, rearrange, and resize your Live Tiles to your heart’s content. With three sizes to choose from and colors from cobalt to magenta, your phone will be unmistakably yours. WinSuperSite: Windows Phone’s Start screen, with its innovative live tiles, has always set this system apart from the competition. In Windows Phone 8, live tiles are even better with a new smaller tile size that fits four tiles in the space that previously occupied just a single medium-sized tile. And with apps now supporting all three tile sizes—there’s a larger, rectangular size as well—its easier than ever to create the customized, personalized Start screen that highlights the content that matters the most to you. It seems like a small thing, but this new ability has significantly enhanced what was already the best smart phone UI around. WPCentral: Turning on the phone for the first time, we see those familiar Live Tiles appear on screen, flipping and changing gleefully, bringing that “glance and go” approach to the end user with ease. What is different about the design this time is the tile-size options: small, medium and large (affectionately called “double wide”). Users can now prioritize their Tiles by manipulating their dimensions, obviating the uniformness of its predecessor. Not only does this make organizing your Tiles smarter it gives users a new level of customization. Sure, it’s not slapping on hideous wallpaper or changing the Tile’s physical look (i.e. skinning), but surprisingly such a small addition has dramatically changed the way the Phone behaves. And when placed next to Microsoft’s Windows 8 (Surface RT tablet), you can see the same look and vision oozing over. WP.com: With SkyDrive, your photos, videos, and Office docs are always available right on your Windows Phone. OneNote on your phone syncs to SkyDrive too, so your notes are always handy. And once SkyDrive is set up, you don’t need to worry about losing your stuff, even if your phone goes missing. It’s all automatically backed up. Automatically upload every photo and video you take on your phone to SkyDrive for safekeeping (with a choice of full or lower resolution). Take your Word docs, Excel spreadsheets, PowerPoint presentations, and OneNote notebooks on the road. SkyDrive gives you 7 GB of free storage that you control: unlike some others, we won’t move or delete your stuff. Start a Word doc or Excel spreadsheet on your computer, then sync it to SkyDrive as you head out the door. Then you can write or edit some more on your phone with Office Mobile—from a cab, the beach, wherever. SkyDrive makes it a cinch to share docs and edit them with another person, too. IGN: “SkyDrive gets you started with more space than any other service, at 7GBs." "Unlike iCloud, you can store your photos as long as you want." WP.com: Hand over your phone without fear. Kid’s Corner grants your little ones access only to the apps, games, videos, and music you choose for them, so you can relax and let them play. They can open Kid’s Corner on their own, but your Start screen, apps, and info are protected by a password you set. Only on Windows Phone 8. GeekWire: To promote the launch of the new mobile platform, and the new features for kids, the company brought out actress Jessica Alba on stage at the Windows Phone 8 launch event in San Francisco, noting that she has has switched from iPhone to Windows Phone as part of her association with the company. Alba said she has personal experience with the problem that Kid’s Corner aims to solve, after one of her daughters sent out a tweet to her 4 million followers from her phone. USAToday: It's called Kid's Corner, and the idea is simple: when your youngsters inevitably grab your phone, or perhaps more likely you hand it to them to thwart off a temper tantrum, you can rest assured that your offspring won't mess with the stuff on the device. Your part of the phone is secured by a password. Once in Kids' Corner, Junior can't accidentally or purposely send a text on your behalf, deep-six an important email, or call your boss (or anyone else). Cyberspace is also off-limits—though if I had my druthers I would prefer that the Internet was OK, provided that I as the parent could explicitly dictate the sites that the child could visit. What the kids can do in Kid's Corner is play the games or run the apps that you specifically approve of, listen to the music that you say is fine, and customize the background in their personal space. Separate from Kid's Corner, Windows Phones still let parents implement parental controls for things like Xbox games. WPPowerUser: Microsoft Office team today detailed the new Office experience that will be part of Windows Phone 8. Office in Windows Phone 8 has full integration with Office 365, SharePoint and SkyDrive and allows you to access your documents wherever you go. Also Office Mobile now features the tap & share feature that will allow you to share documents via Bluetooth or NFC. Office on Windows Phone 8 is now available in 50 languages, supports complex script, and UI mirroring. UI Mirroring means for Right-To-Left languages, not only does the text alignment and text reading order go from right to left, but also the UI elements layout follows this natural direction of going from right to left. With a rich array of device configuration and management capabilities, it's easy to integrate Windows Phone into your Windows infrastructure. Outlook, Lync, and other Office Mobile apps With familiar Office Mobile apps built-in, Windows Phone offers everything you need to get up and running right out of the box. Office 365, SharePoint, and Exchange Collaborate and keep connected to important information while on the move. Download Office documents from SharePoint or Office 365. Line of business apps and Company Hubs LOB apps are under your control. You can develop, package, sign, distribute, and maintain your apps end-to-end. Windows Phone security and encryption Robust security to help protect your business information and guard against malware. Windows Phone and app management Rich phone management capabilities make it easy to integrate Windows Phone into your Windows infrastructure. WinItPro: Put simply, Windows Phone 8 is the smartphone OS for which Microsoft-based businesses have been clamoring. It’s based on Windows 8 -- real Windows -- and not the sort-of-Windows of Windows CE. It shares the same NT-based kernel, networking stack, security, sensors, multimedia platform, web browser, and other components found in Windows 8 (and RT, the ARM-based Windows 8 variant). This is important on a number of levels, but it means that Windows Phone 8 will share many of the same proven and well-understood technologies from Windows, as well as the same drivers, support for the same services, and more. WP.com: The Windows Phone Store has apps for whatever you've got going—and only Windows Phone has Live Apps that put the info you want right on your Start screen. Most apps are free, and you can often try before you buy. Plus Microsoft certifies every single app to help protect you from malware and viruses. GeekWire: Microsoft is launching a new feature called Data Sense for Windows Phone 8. It’s a companion, of sorts, to the limited and shared data plans that have become popular among some of the major wireless carriers. The feature compresses web pages, shifts data to WiFi whenever possible, adjusts network settings and delivers alerts as users approach their data limits. WinSuperSite: Data Sense is a set of technologies that helps customers on metered mobile broadband connections save bandwidth so they can use their phone more. This includes IE 10 bandwidth compression, integration with Wi-Fi to help find nearby hotspots and automatically connect, adjusting network settings as you approach your data plan limit in each billing month, and a tile- and app-based UI that shows where you are within your monthly limit and how much data each app is using. Data Sense also provides pop-up notifications and Live Tile updates when you’re getting close to the limit. WPCentral: Data Sense is a new feature that will allow users to save money by managing data. It works by using the cloud to compress information before being sent to your phone, thereby cutting down on bandwidth. It can also help you find Wi-Fi spots to offload data from your carrier and become more aggressive as you data limit is reached. Data Sense though is carrier-supported and integrated, so don’t expect it on all Windows Phone 8 devices, though surprisingly Verizon will be the first out the door with it with other carriers following in 2013. WP.com: Windows Phone is the only phone with a People Hub, where you’ll find your contacts, kick off conversations (phone, text, IM, email), check out your friends’ latest posts and photos, get to your Rooms and Groups, or even make a Skype call right from a contact card. Who’s picking up the kids? What do we need from the store? With Rooms—an invitation-only place on Windows Phone—everyone’s in the loop. Invite people to a room, then share notes and to-do lists, a calendar, photos, and group chat, all in one intimate space. Only Windows Phone 8 has the full Rooms experience. But you can invite someone with a Windows Phone 7 or an iPhone—they’ll be able to use the room calendar on their phone. WPCentral: Rooms have five areas: members, chat, photos, calendar and notes. Under the members section, you can single-tap invite your contacts to your new Room. You can name the room and even add wallpaper to it to give it some flare. The Chat area is built off of Microsoft Messenger and allows users to instant message each other. Photos and Notes allow you to share those items, including videos while Calendar is just that, a center for sharing appointments. Finally, you can pin that Room to your Start screen where the Live Tile will keep you posted on any updates via Notifications. Skype is always on, always ready to receive a call without killing the battery. Also: Words with Friends, Chase, PayPal, Draw Something. And more (46 of the top 50 apps on all other platforms): Temple Run, Urban Spoon, Fairway Solitaire, Where’s My Water, and Angry Birds Star Wars. And, Pandora (early 2013) with a one year free subscription to their commercial-free service. Skype: It's been an exciting few weeks for the team at Skype. We've launched our new fast, easy-to-use and beautiful Skype for Windows 8, and updated Skype for Windows desktop and Skype for Mac to version 6.0. Today we are announcing the soon-to-be available Skype forWindows Phone 8, which features the beautiful and modern design Windows Phone users have come to love while, like Skype for Windows 8, delivering the best of what you've come to expect from Skype. Always Reachable Just like on Windows 8, Skype for Windows Phone 8 enables you to receive chats and notifications for voice and video calls even if you've navigated away to another app or have your phone on lock, so you can stay connected with your contacts whatever you're doing. Best of all, this all happens with limited battery drain. Easy-to-Use We've set out to bring Skype to Windows Phone 8 with a clean, beautiful and modern interface. When you first open the app, your most recent conversations and chats are the first thing you'll see. From there, you can pan over to your contact list or the newly added Favorites screen (more about that below) or see your entire contact list. Your People At Your Fingertips Just like Windows 8, once you sign in to Skype on your phone, your Skype contacts are automatically added to your Windows Phone, making it possible to call the people who matter to you via Skype right from the People Hub. And finally, just like on Windows and Mac, if you have linked your Skype Name and Microsoft account, you can now see and chat with your Messenger buddies on Skype, making it possible for you to connect with more people than ever. And with the family of platforms Skype is available on, including PCs, iPhones, iPads, Kindles, Androids, Macs and even TVs, doing things with your friends and family whenever you are apart has never been easier. WPPowerUser: Today Skype detailed the new Skype experience on Windows Phone 8 platform. The new Skype app features a beautiful design with support for multiple live tile sizes. Also you can set Skype notifications on lock screen and Skype is integrated into People Hub contact cards for easy access. Skype for Windows Phone 8 enables you to receive chats and notifications for voice and video calls even if you’ve navigated away to another app or have your phone on lock, so you can stay connected with your contacts whatever you’re doing. Best of all, this all happens with limited battery drain. For the first time, incoming Skype calls arrive using the familiar incoming call screen from Windows Phone. We have also included useful new features such as call waiting, so switching between a Skype call and a regular mobile call is fast and easy. WP.com: With NFC sharing, you can tap your phone on another NFC-capable device (like a tablet or your friend's phone) to share things like photos, contacts, songs, and webpages. WPCentral: Apple recently introduced a similar feature called Passbook in iOS 6 but they omitted near-field communication (NFC) support. Microsoft has embraced this technology. NFC allows you to make payments in stores and outlets that support it by simply tapping the phone to a device. While NFC is still in its infancy for mobile payments, Windows Phone 8 has been made future-proofed for when this technology finally does go mainstream. In the meantime you and your friends can use NFC for sharing contacts, photos and other bits of info simply by tapping your phones together or with NFC enabled PCs. WP.com: Launch the camera with the press of a button, then take a photo or shoot HD video—even when the phone is locked. Express yourself with Lenses, photo apps that work right in the camera’s viewfinder. Then post or text your creations straight from the camera (no need to open separate apps). Plus, you can set your phone to automatically back up every photo and video to SkyDrive, keeping your memories safe and snug in the cloud. Lenses are photo apps that work right in the viewfinder so you can unleash your creativity as you point and shoot. And they're only available on Windows Phone. Take crisp HD video, up to 1080p. Then share it with friends on Facebook or send it up to SkyDrive to enjoy later. On-screen Flash control – Turning the flash on/off/auto was previously buried in the menu on Windows Phone 7. Windows Phone 8 makes it a permanent icon on the screen. Tapping it also flashes the text of the selection briefly on screen for a good visual confirmation. Photo Review – In WP7, users would see about 1/12 of the previous photo on screen in the camera with an arrow. Grabbing that tidbit allowed you to review your photos on the fly. Now, it is just an arrow and more interestingly, it is dynamic. By that we mean it is based on your orientation: horizontal results in a horizontal film strip, but holding the phone vertically will match that. WP.com: Listen to your tunes, watch videos, subscribe to podcasts, and create Smart DJ playlists based on the music you love. Add an Xbox Music Pass to download or stream music from a global catalog of 30 million songs. You can listen to your iTunes music on your Windows Phone, too. Download the Xbox SmartGlass app to control your Xbox with your Windows Phone. Start a show on your phone and move it to your TV, browse what's on your Xbox, and more. WP.com: You can use your phone's Wallet to keep your reward cards, coupons, credit cards, local deals, and memberships in one convenient, password-protected place. Linked apps can keep your Wallet up-to-date with card balances and other info, too. WPCentral: One neat feature of Wallet was how it automatically imported our Microsoft Account information including our stored payment options. For us, that included PayPal and a Visa card and it was curious to see that stored automatically on our device. WP.com: Get things done using only your voice: make a call, launch an app, send a text, take a note, find something online, and lots more. The Word Flow Keyboard learns to predict the next word in your sentence for high-speed typing—and has tons of colorful emoticons for high-speed emoting☺. WP.com:Send your app list, text messages, photos, videos, and Windows Phone settings to the cloud for safekeeping. Verge: We understand that the backup options in Windows Phone 8 include the ability to automatically upload photos and video to SkyDrive, sync SMS and MMS messages to Hotmail or Outlook.com, and sync settings such as themes, accounts, and Internet Explorer favorites. App lists and individual app settings will also be synced as part of a backup routine. The options, which haven't been present in Windows Mobile or Windows Phone software previously, will be a much welcomed option that should help Microsoft offer a similar experience to iOS users with iCloud or Google's own Android backup options. WinSuperSite: Microsoft has finally added screenshot support in Windows Phone. Now, you can just press the handset’s Start and power buttons and a screenshot will be taken and saved to the Screenshots album in Photos. And, it’s clear, there are even more models to come. Verizon is now all-in. T-Mobile, and AT&T remain true partners! 191 countries – did you even know there were that many countries? WPCentral: The “High Contrast” mode was first detailed by WPArea.de back in July when the first SDK initially leaked. In short, it allows you to go to an all “black and white” theme including white on black or vice versa. Obviously this is meant for people with visual impairments but evidently a lot of you are enthralled with its appearance—guess we can call it Metro extreme mode? The other screen shots show how you can adjust the font size for Phone, People, email, messaging and the lock screen and use a screen magnifier. The magnifier works by using a two-point double tap to engage and then you can pan with your fingers to zoom in or out. Finally, you can use speech assistance for speed dial, call forwarding and announcing caller ID. WPCentral: Windows Phone 8 also brings higher resolution displays, including 1280x720 and 1280x763. Once again, while we didn’t have too many complaints with 800x480 from the Windows Phone 7 days, no one is going to deny that the OS looks much better at the higher resolution. Contact photos (especially on the People Hub Tile), text in IE10 and games all look much sharper to the eye and the OS just pops now. Apps in the Windows Phone Store are certified, checked against viruses and malware. It’s not a rat’s nest of apps that make discovery nearly impossible, and is neck-deep in user regret. Lost your phone? Use http://devices.live.com to look up the location of your device! This is cool if you think your phone is on the move and you are at home! 23. Make my phone Ring! Phone in your couch? Use http://devices.live.com to make your phone ring; even on silent! I have found my phone many times like this. The shrill ring let’s me find my phone anywhere in the house. 24. Update over the Air! Never plug in again. That’s serious with the Lumia wireless charger! But, update your Windows Phone software and get new features over the air—without connecting to a computer. Facebook, Twitter and other Social Updates are part of the OS, not some app you have to run. See what you want, do what you want – all fast, all integrated. Have an edge-case feature you really need to use? Sure, you can run the app; we have those too! You heard me! WP: Download high-quality country and region maps that you can use offline, find walking or driving directions, and keep a list of your favorite places. The “Apps for you” in the Store take you and your friend’s Facebook likes and your Xbox activity and recommends apps that fit “who you are”. You won’t find that on any other platform! The Lumia 920 has optical stabilization! You read that right? You bet. You can add Lenses which are cool. But optical (not digital) stabilization means your photos are sharp! It’s always been there! But, now, we’ve extended the ways you can speak to your phone, including a Speech API that developers can use in their apps! Come get some! Every song you have purchased from Xbox music is available on your phone. Plus with Music Pass, you can stream any other song instantly. No wires. No waiting. Zune? Windows Media Player? ITunes (seriously?) you can quickly and easily sync your content from a PC or even a Mac, which I hear is a kind of computer out there ;). It literally learns what you type frequently. It recommends words so you don’t have to type them yourself. Typing on Windows Phone 8 is incredibly fast and easy. There is no phone in the universe that has more Xbox live titles than Windows Phone. There is no phone with as much Xbox integration. There is no phone with rich DirectX support! Windows Phone 8 SDK is ready for you. We don’t punish you with X-Code or suffer you through a crappy emulator. The Windows Phone 8 SDK give you XAML, a .Net experience and the power of WinRT on Visual Studio with a real emulator and real testing and profiling tools. Wanna expand your mind? Good luck. Wanna expand your phone’s memory? Well, if your hardware has a slot, the OS supports it. Crank it up. Even cloud-enabled can benefit from space sometimes. Windows Phone 7.5 customers are going to get upgraded to Windows Phone 7.8 – with the same great UI that we love on Windows Phone 8. Make it all about you! Finally, a phone so simple, so comprehensive, and so functional that I don’t have to be “help desk” for my in-laws. Show them the basics and let them run. Wait for the support call… crickets. That’s a real win in my book. No other phone (think, Android) could ever come close. No other phone (think Apple) could withstand their constant drops and hits. Maybe that’s just me. Hey, don’t miss “10 Reasons Why I Choose XAML over HTML5”!